A custom fitted tray is worn over your teeth. A small amount of the bleaching gel is placed in the tray and worn for a brief amount of time each day. This is a common technique because it’s easy to use and costs less. Impressions are taken of your mouth and a thin custom made plastic tray is made which you take home and wear for about one to two hours per day or for the absolute best results you can wear one type of system all night. While some results may be seen in a couple days, it usually takes one to two weeks to see the full whitening of your teeth. This procedure is sometimes used in conjunction with the in-office Power bleaching if you have severe discoloration (dark grey or purple) or internal teeth staining. Disadvantage: This procedure will require multiple visits to the cosmetic dentists office. ZOOM whitening uses a special light with a whitening gel. These are in-office bleaching systems. It is often followed up with an at-home bleaching kit if needed. A: Tooth whitening, also known as bleaching, uses various processes to lighten your teeth from their original color to a brighter, whiter smile. Reasons people have their teeth whitened are either to get rid of stains or simply for a whiter color. Q: How does tooth whitening work? A: Most tooth whitening materials have a peroxide ingredient. When this agent comes into contact with water it releases hydrogen peroxide, which then lightens the color of the teeth. Q: Is tooth whitening safe? Does it have any side effects? A: Tooth whitening has been shown to be a safe and effective method of getting whiter teeth in many studies done over the years. Tooth whitening products have garnered the seal of approval from the American Dental Association (ADA). The only side effects people may encounter are minor gum irritation or tooth sensitivity, which should disappear at the end of the treatment. Q: What makes a good tooth whitening candidate? A: Ninety percent of people or more make good candidates for tooth whitening. However, if your stains were caused by flourosis or tetracycline, you may get lighter teeth, but the results generally aren’t as striking compared to the results on other types of stains. Q: How long do whitening results last? A: There is no definite answer because each whitening patient is different. Factors that can cause differing lengths of results include your heredity and how many staining foods and drinks you consume following treatment. 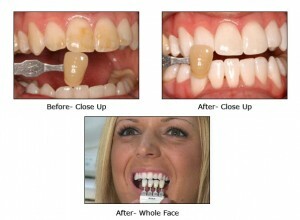 A lot of whitening patients can see results last anywhere from one to three years without needing major touchups. If you want longer lasting results, Composite Veneers are an alternative that can give you a whiter smile for a much longer period of time. Q: What results can I expect with tooth whitening? A: Because everyone is different, there is no way to tell for sure how much lighter you teeth will get. You can usually expect at least a two-shade improvement from your original coloring. However, the amount of whitening achieved also depends on what type of stains or discoloration you have and how well you follow the dentist’s orders. If your teeth are gray, for example, you will probably only achieve a lighter shade of gray. Also, whitening does not work on artificial dental materials in your mouth such as resin, composite, or porcelain. Q: What about over-the-counter whitening products? A:People often tell us that they aren’t satisfied with over-the-counter whitening products’ results. By definition over the counter products have to be safe even when abused, this means that many of the active ingredients have to be removed. People generally get better results with in-office whitening or dentist-supervised home treatments.